Worked with a new event / Luxury pop up hotel for Goodwood Revival. We had a very short 6 week time from start to the event to get results. Our remit was to target High net-worth individuals in UK, Dubai and Europe to make them aware of the venue and make a booking. We built the landing page and integrated it with the booking system, adding the analytics and pixels to track and measure results. We created a Facebook Messenger competition that generated 1200 leads. The competition was launched on 31st July to run for 2 weeks. Entrants had to comment with the word “Revival” to be classed as entering. By commenting, the user was subscribed to the TGFH messenger subscriber list. Follow up posts, broadcasts and videos were used to drive engagement and participation. 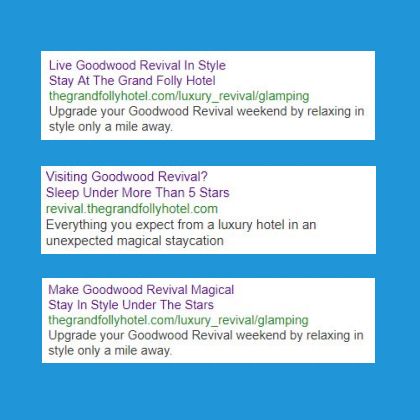 We setup a Google Adwords campaign based on popular search terms for Goodwood. 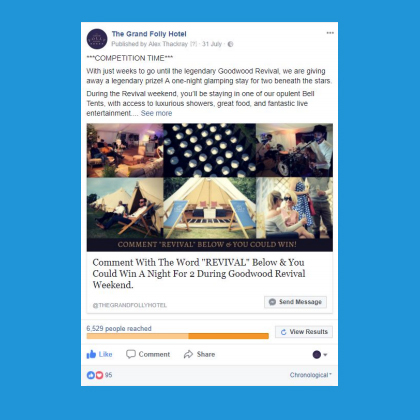 Focusing on the Goodwood Revival keywords gave enough search traffic to convert nearly 1,000 clicks over to the landing page. The ads were also positioned highly in the search engine ad spaces despite limited previous history for Google to benchmark a quality score against. The TripAdvisor quote Ad Extension also contributed valuable numbers of clicks to the campaign showing their effectiveness. We created retargeting and upsell ads to people not booking and to add spa treatments, dinner etc to those that had booked.